Happy new year everyone! The year of the monkey has begun, which means the Monkey CAL has come to an end. So many monkeys were made (29!) using my Tiao Pi monkey pattern – and ALL of them were extremely adorable. You can see them all in the CAL thread on the hookabee ravelry group page. To determine the prize winners, I assigned each project that was entered in the CAL a number (in order of appearance) and used random.org to generate three numbers. The first number generated was the ultimate winner of a hook by HeartSprinkle AND a hookabee pattern, and the second and third numbers generated each won a hookabee pattern of their choice. The winners were…. 3rd Place: Eileen with her snow monkey! 2nd Place: Wendy with one of her hanging monkeys! 1st Place: Aimee with her upside-down monkey! Thank you to all who participated in the CAL – it was so fun seeing all the monkeys come to life with your beautiful work and fun pictures. I also want to thank Krystle of HeartSprinkle for sponsoring the Monkey CAL and for providing such an awesome prize! 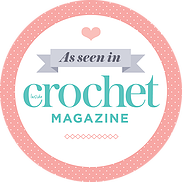 She is so talented and makes super cute, high quality handmade crochet items that I love. Check her out! Now I need to think of what the next CAL will be… Stay tuned!